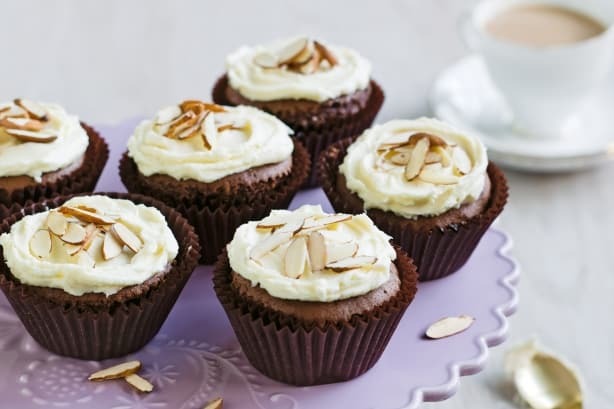 This recipe is by Masterchef finalist Marion Grasby, and is the perfect cup cake when you have a chocolate craving. They’re so moreish you cant stop at one and the salted icing with sliced almonds provides a nice salty/sweet crunchy contrast between the sweet chocolate cupcake. Using an electric mixer, whisk egg yokes, sugar and 2 teaspoons water on high speed for 3 minutes or until thick and pale, then fold in almond meal. In a clean bowl, whisk egg whites to soft peaks. Gently fold one- third into chocolate mixture until just combined, then fold in remaining egg whites until just combined. Divide batter among 12 paper cases and bake for 30 minutes or until a skewer comes out with moist crumbs. Whilst cupcakes are cooking start on the icing, using an electric mixer. Beat butter, vanilla and almond essence and salt until pale and fluffy. Add sugar, 1/2 cup at a time, beating until well combined. Cover surface of icing with plastic wrap to prevent it drying out. Set aside. Stir icing to a spreadable consistency if required and then spread over cup cakes. Top with roughly sliced almonds.